Heather, Holly, Jeff, and I are all going to watch Serenity tonight. This is a movie spin-off of a sci-fi television show that was canceled after one season. I don't know how a show as awesome as Firefly was canceled, but it was. Luckily, due to high DVD sales and a rabid cult following, a movie has been made (and if it's good, hopefully more will follow). So, if you want to see a different style of sci-fi (this is like a space cowboy show and breaks a lot of "rules" that most sci-fi shows seem to follow) check out Firefly. And, go watch the movie so they can make enough money to make more. I normally spend about $15 a week on beer. My plan is to stop buying beer and instead put $15 a week into an iPod Nano fund. Also, my birthday is coming up in 1.5 months, so I will be accepting deposits into the iPod Nano fund as birthday gifts. Man, I want one of these so bad! Apple came out with a new iPod yesterday, and I've been drooling over it ever since. The dimensions on this thing are 3.5" high x 1.6" wide x 0.27" thick. 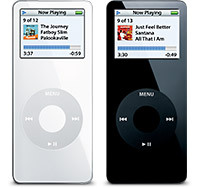 The nano comes in sizes of 2GB and 4GB, with a color screen, and their slick as oil "click wheel." I used to think there wasn't anything special about iPods until I used that click wheel interface. It is the coolest user interface ever. In case you're wondering, I'm eyeing the 4GB one ($250).